One of our members found her kids at the front window, and when she asked them what they were looking for, they said, “We’re waiting for the veggie fairies.” They were waiting for us! It’s the perfect description of what we do. We connect Virginia families with local family farmers with magical results. These days there are about one hundred of us – mostly moms who believe in living better through scrumptious healthy eating, being kind to animals, protecting the environment, and spreading joy. 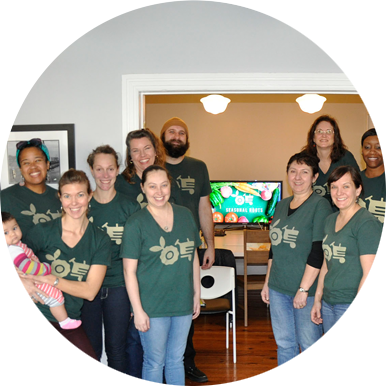 Seasonal Roots empowers us to do all that! We start by getting to know our local farmers who practice sustainable farming. Then, based on their seasonal planting schedules, we list their harvests on our online farmers market: delicious, nutritious produce, grassfed dairy and meat, pasture-raised eggs, and all-natural artisan fare. We spread the word to our members, who are also our neighbors. After they place their orders each week, we collect all that fresh, local food from our farmers and artisans and deliver it to our members. In the process we’re all helping make the world a better place. Just look at our logo – are those leaves on the tractor tire? Or fairy wings...? Many of our farmers are multi-generational, like the Saunders Brothers, a family that’s been caring for their orchards for a hundred years. 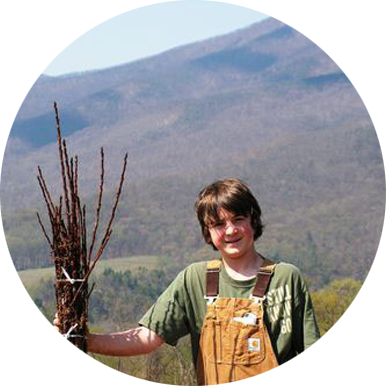 (That’s young Tye Saunders in the photo, helping plant trees.) Or Gerardo Flores and his son Omar, who grow an astounding variety of peppers and other vegetables. Our farmers have a personal stake in protecting the land for future generations. So they use safe, sustainable farming practices to grow their food as nature intended. They rely on their land’s natural biodiversity to keep pests in check and have a low-to-no-spray policy. Many of our farmers also abide by the standards of USDA Organic. Plus, all our animal products come from pastured animals who live happy, healthy lives with plenty of room and fresh air. We also partner with local food artisans, who craft fresh, handmade fare from wholesome ingredients. Whenever you place an order, you can learn about the farmer or artisan who produced each item in our weekly farmers market by clicking on the link next to it.